The Lower Jordan River is the 65 mi. [105 km.] portion of the Rift Valley that stretches from the Sea of Galilee to the Dead Sea. Because of its windy nature its actual length is about 135 mi. [215 km.]. Along its path the very powerful Yarmuk River and the Jabbok join it on the east. On the west the Nahal Harod and Wadi Farah flow into it. The flow of the Jordan today is only a meager portion of what it used to be for the Israelis pump water out of the Sea of Galilee for drinking and agricultural purposes, and only let a very small portion flow out the southwest end of the Sea of Galilee. 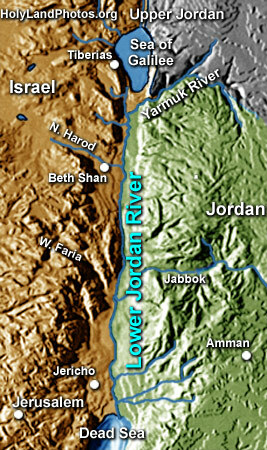 In addition the Jordanians divert a major portion of the Yarmuk River for similar uses, and this river was a major source of water for the Lower Jordan. Prior to all of these diversionary usages the Jordan was about 100 ft. [30 m.] wide and 3 to 10 ft. [1 to 3 m.] deep — swelling in the floods of spring to almost a mile [1.6 km.] in places.